is a company that will buy your unwanted items directly from you for cash. If you use the promo code InfinityFans during checkout an extra 10% cash value will be added to your order. How do you trade your items for cash? Step 1: Add any Items you would like to sell to your cart selecting the appropriatecondition for each item (the definitions of each condition are explained well on the site) and the value will adjust accordingly. Step 2: Confirm Your Order (because Trade4Cash pays for shipping, there is a minimum order value of $10). Once you agree to their terms and click Place Order Now, you will be taken to a page where you can print off a packing slip and a prepaid shipping label. Print off the Packing Slip and be sure to include it with your order. This will greatly speed up the evaluation process once they receive your order. To ensure your items aren't damaged in transit use a sturdy box and pack around your items with bubble wrap or old newspaper. Print off the prepaid Shipping Label and tape it to the outside of the box. Drop the box off at any USPS location and the hard part is done. Each of these emails will update you on when has been done and what will be done next. If they need any further action from you (which is rare) they will let you know right away. 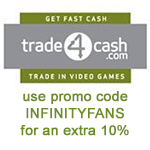 Don’t forget to use promo code InfinityFans during checkout to get an extra 10% cash value added to your order.